After the iconic images from the Trenches of soldiers wading through mud then next most common images are of snow covered battlefields. After listening to historian Steve Smith dispel myths and show how we can’t always trust photographs I decided to do some research in to this and see if it was snowy on the Western Front or if these images are actually of the Eastern and Balkan lines. This image, was taken in early 1917. 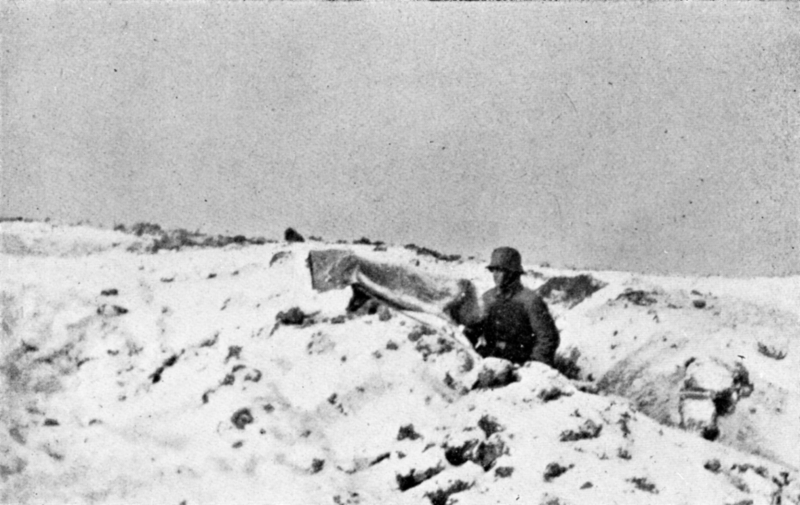 It shows a German machine-gun position in a forward trench close to the village of Le Transloy on the Somme. Met Office reports for the UK in December 1916 list the month as having “weather conditions appropriate to the month of the winter solstice – cold and inclement, with frequent and severe frosts and a good deal of snow.” Snow depths of up to 23cm were recorded in some areas of Wales and Scotland whereas “the streets of Dublin were exceptionally dangerous on the 17th, when some 300 cases of accident were treated in the hospitals” due to the ice. February was a much worse month being listed as “Stormy, Mild, and Rainy, then Cold with much Snow.” The snow, when it arrived towards the end of the month, was particularly heavy with Norwich (specifically mentioned) recording 261% of the average expected. The drifts in Dartmoor were 3 ½ metres deep. This cold and snowy weather continued through March and well into April, which in places was the coldest recorded since 1856. Records show that it showed somewhere in the UK every day right up until the 19th of April. However as was noted in a previous post about wartime weather however close to the Western Front areas of the UK are the weather conditions may not have been mirrored. 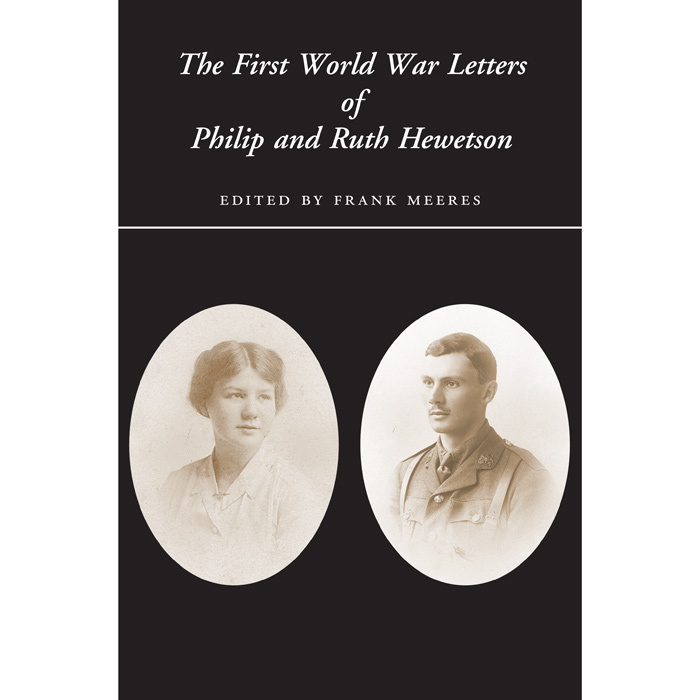 By reading some of the diaries and letters available from men serving in France and Belgium we can get an idea that the winter of 1916/1917 was exceedingly cold, snowy and unpleasant in France and Belgium too, although December and January seem to be swapped in conditions! On the day before Christmas Eve, we left the trenches to go into billets. The trenches had become very uncomfortable owing to the prevalent wet weather, and we were glad enough to leave them. We had to march six or seven miles […] There was a head wind, which at times almost brought us to a standstill. We have been having a very severe spell of cold weather. The French people say that they have not had such a frost for over 20 years. For weeks now the whole country has been covered with snow, and all the streams and ditches are covered with ice many inches thick. The cold weather is very trying for the troops. 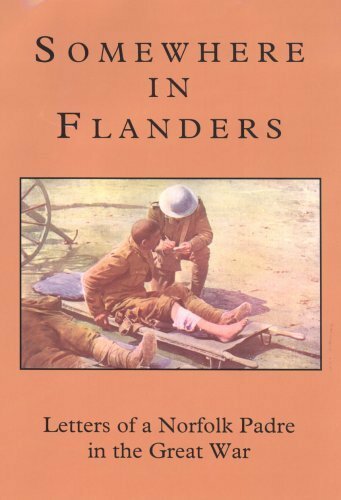 When we are in the trenches it is not possible to keep warm because it is impossible to move about very much, and it is not always possible to have much of a fire because the smoke might attract the unpleasant attractions of the enemy over the way. So we have been very cold in the line. Curious all the frost you have had & snow, here mild for the time of year & cloudy, some rain and everlasting wind. I sincerely hope it will not freeze, so hard on the poor men in the trenches standing in mud & water up to their waists, it would mean so many frozen feet. Weather still cold & bright, but not quite as bad as it was. It freezes night & day. Such a long spell. We dread rain here as this limestone country is so sticky & messy, still the roads even after rain will be a treat after the Somme. Such a job to get dry wood & keep warm. It keeps us busy cutting & splitting for kitchen & our wretched little oil drum stove in room where we eat. My friend who went home a few days ago left his petrol stove & I keep it in my room all day going & it makes quite a difference. Without it was just an icehouse. At last today a bit milder, been bitterly cold day after day, freezing day & night. Almost as you throw out water it freezes. Clear days. Seems coldest winter in France since 70! Home too it seems cold & snowy & a lot of skating, so it has given some pleasure. Fortunately for all of those in France this does seem to be the last report of really bad weather for this winter as the cold is not mentioned again. This bad weather didn’t stop the fighting however and while there were no campaigns on the scales of Ypres or the Somme there were still deaths. 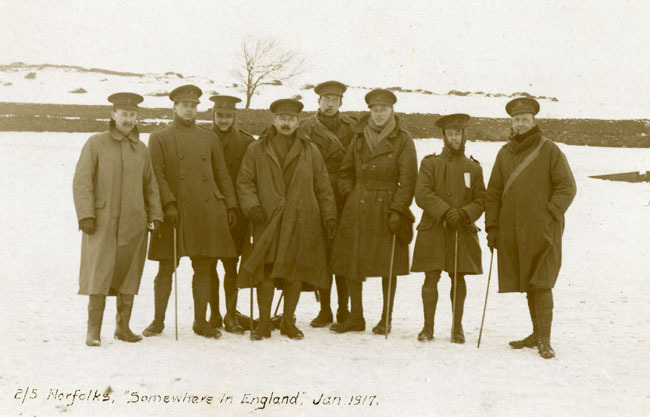 The Imperial War Museum has a recording of an actual WW1 Veteran NCO Clifford Lane recounting his memories of winter 1916/17 which you can find here along with other first-hand accounts. 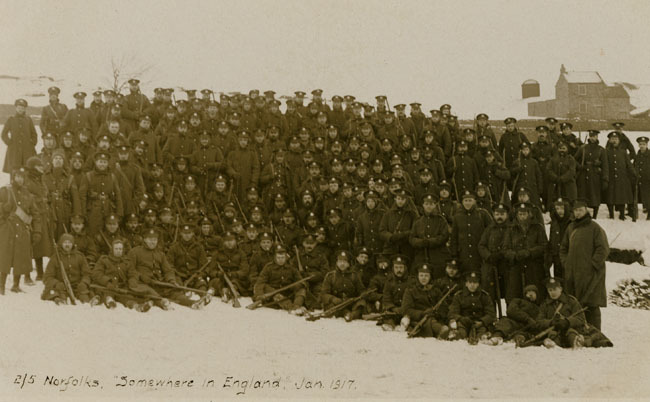 This entry was posted in research project and tagged Norfolk, Snow, trenches, weather. Bookmark the permalink.